RoyalEnfields.com: Will we ever forget why we love British motorcycles? Will we ever forget why we love British motorcycles? A Triumph Daytona, obscured by a fence. 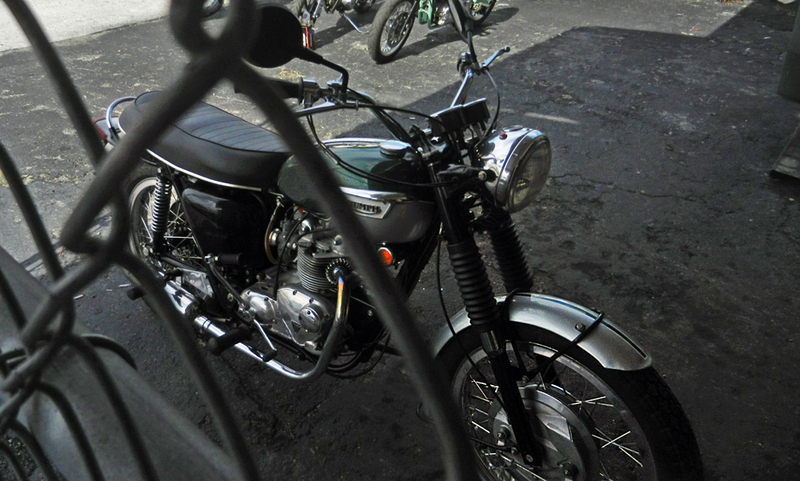 Triumph Bonnevilles are the featured class for the 10th Annual Dania Beach Vintage Motorcycle Show Saturday, Jan. 30, 2016 in Frost Park, Dania Beach, Fla.
Will the day come when we forget that British motorcycles were ever anything special? Perhaps even those who buy Royal Enfield motorcycles will forget the name originated in Britain, and associate the brand only with India. After all, far more Royal Enfields have been built in India than Redditch ever imagined. And England's final jewel in the crown, the Royal Enfield Interceptor, went out of production 45 years ago. British brands in general slipped from dominance of the world motorcycle market a long time ago. The final "glory years" for made-in-Britain motorcycles were years of riding on reputation. Even if reliability did improve at the end, no other nation's motorcycles have forged such a lasting link to leaking oil and lousy electronics. The world's attention span might have withered even earlier if the Rocker and cafe racer culture hadn't combined to give British motorcycles one last burst of excitement back in the Swingin' Sixties. I turned recently to the book "The History of British Bikes," by Roland Brown. This is a 1999 book, picked up at a bargain on the Internet. 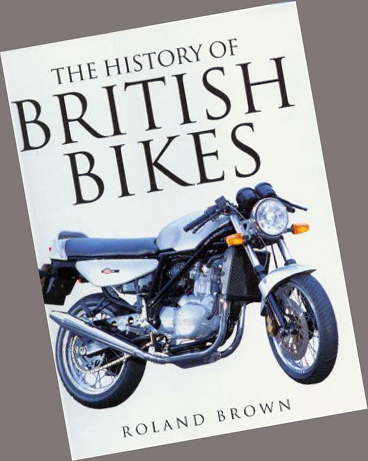 The History of British Bikes. 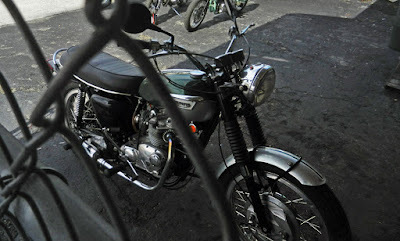 "Roland Brown's first proper motorcycle was an elderly 650cc Triumph Bonneville. Although it broke down on his first ride and again on many other occasions, it triggered a life-long love of British bikes." He opens his book by cheering the rebirth of Triumph and looks forward to a bright future for British brands — but not renewed dominance. 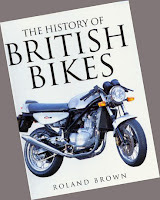 The unspoken message of this history book, naturally, is that the past is the reason we love British bikes. As for Royal Enfield, Brown's book mentions the made-in-India Bullet but concentrates on the spiffier Royal Enfield Constellation, a big, powerful twin he calls "fast but flawed." Naturally, the book celebrates the technological pioneers among British motorcycles and the glory they won. And what stories they are: Rem Fowler, riding a Norton in the very first TT event on the Isle of Man in 1907, spent so much time changing tires, drive belts and and spark plugs that he decided to quit — only to be informed by a spectator that he was leading the race by half an hour. He went on to win his class. But there is also a guilty pleasure in considering the "what ifs" and "if onlys" of history. I like these even better. If British motorcycles didn't leak like a "Royal Oilfield" then they had mediocre brakes (Ariel Leader), fragile valve gear (ABC), were swallowed up by corporations (AJS, BSA), or killed off by war (Brough Superior, Levis, New Imperial). The wonderfully named Douglas Dragonfly was "heavy, expensive and not particularly fast." The James firm's concentration on lightweight motorcycles made it particularly vulnerable to the leading edge of Japanese imports. When the British motorcycle industry presented a Sunbeam S7 to World War II Field Marshall Bernard Montgomery at the London Motor Cycle Show of 1948, the firm's stand collapsed. The industry just never got a break. Even when they were awful, British motorcycles were memorable. Motorcycles from England and the failed British motorcycle industry itself are likely to remain worthwhile reminders of what can go wrong as well as what can go right. As long as people ride on two wheels, these stories will remain just too precious to forget. We Brits were the instigators of many models and made excellent machines between the wars. But WWll drained and wore out our manufacturing capabilities and we rested on our laurels thereafter, making the same kind of bikes as we had always done (with minor improvements). The industry was bedevilled with poor, incompetent and cynical management and once the elegant Jap machines began to arrive in the 1960's it fell apart. It was a shame, but it only got what it deserved. I have owned about 55 motorcycles, but started to buy either Jap or German (BMW) in the 1970's and kept one BMW 1000cc for 25 years, with utterly complete reliability. (wonder if a Brit bike would have lasted so long and so well). Age and infirmity meant that the BMW had to go and I now potter around on a Royal Enfield Classic Chrome 500cc EFi which is lighter and the easiest bike to ride that I have had in a long time, although I doubt that its longevity will compare with the BMW! The books to read about all this (if you haven't already) are "The Strange Death of the British Motorcycle Industry" and "Whatever Happened to the British Motorcycle Industry".